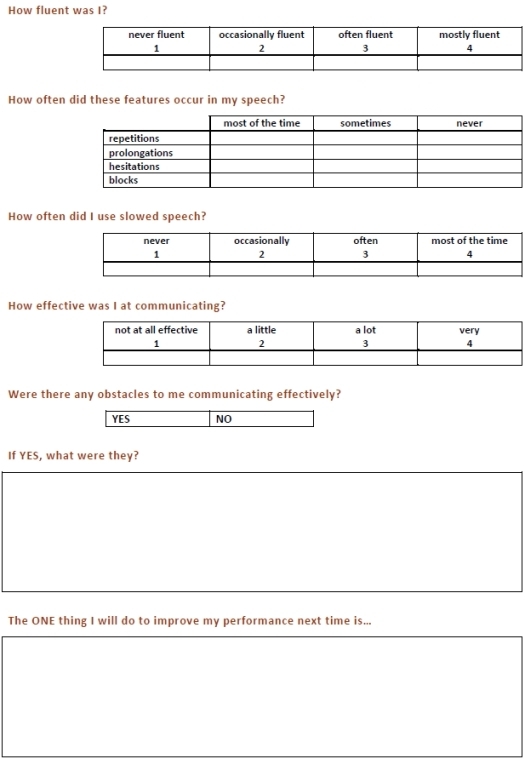 This is a seven-item self-administered evaluation designed to help people who stutter (1) develop insight into the features that typify their speech, (2) assist them in monitoring their fluency, and (3) set goals for improved speech performance. 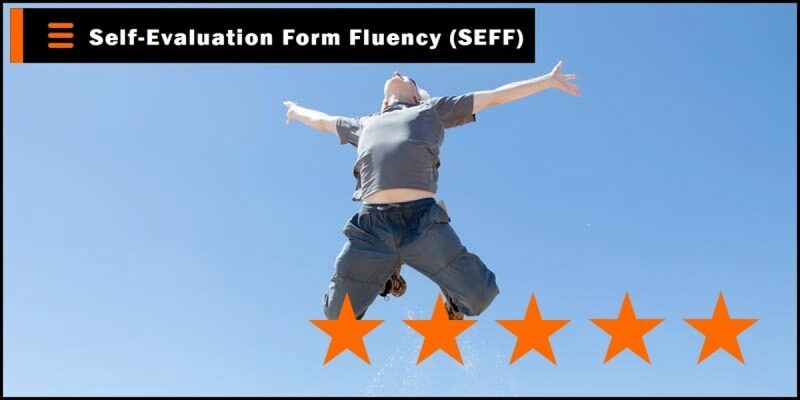 The evaluation form is useful in a variety of situations, such as at the end of individual or group speech therapy sessions, subsequent to carrying out any speech-related activities (e.g. buying items face-to-face, using the telephone, talking to strangers), and monitoring behavioral goals. It is especially useful for people using a prolonged speech technique. Whilst there are three quantitative rating scales, no standardization or inter-tester validity is claimed. The figures obtained from the scale serve only as a feedback for the client to monitor performance and progress over time. Blocking typically occurs when two articulators come together with excessive force, e.g. when the two lips come together to form the consonant sound /b/. Rather than parting the two articulators rapidly and easily, the speaker is unable to release the contact between them and a great deal of tension may build up. In severe cases a speaker may be unable to release a blocked sound for several seconds. Fluent speech is the smooth, easy flow of speech when a person speaks without tripping up over their words and without a lot of repetitions, prolongations, hesitations and blocks.